We begin the week again with an update on a new initiative that will help us continue beyond April 2017: This week, we’re thrilled to welcome Shelley Schanfield and Fiona Le Brun as our new sustaining members! Our most updated tally, as reflected on the right-hand column, is now 37! If you’re considering becoming a part of the family too, why not let lighthouse keeper (and hit author) Reif Larsen take you on a tour, before you sign up here! It was lit and spread around. India, according to its constitution, has twenty-two ‘scheduled’ languages, with hundreds more spoken across its twenty-nine states and seven union territories. While it is impossible to capture the full swath of India’s languages in a single Special Feature, Asymptote’s Winter 2017 issue offers a glimpse into the political and aesthetic possibilities of Indian languages. The Feature’s nine poets, covering seven languages, were chosen with the aim of celebrating the diversity and dissent within contemporary Indian language poetry. Vidrohi’s “Mohenjodaro” emerges directly from a site of protest, Jawaharlal Nehru University (JNU), the revolutionary spirit of which has recently come under attack from various political factions. Vidrohi spent most of his life as the unofficial, resident poet-activist of JNU, reciting but never writing down his poems—as a mark of resistance. But his words have been preserved in differing transcriptions by various students. “Mohenjodaro,” like many of Vidrohi’s works, has no definitive text—it carries on the centuries-old tradition of oral poetry in the Indian subcontinent. Aggressive and unabashed, the poem, with each line, builds its indictment of patriarchy, colonialism, and of the nation itself. To honor the poem’s orality and to observe how literature can exist in multiple lives, the Special Feature includes two translations of “Mohenjodaro.” Each translation stems from a different ‘original,’ and so is markedly different, reminding us that language resides beyond the page, in telling, listening, and remembering. I know this poem is really weak—just like a menstruating woman. 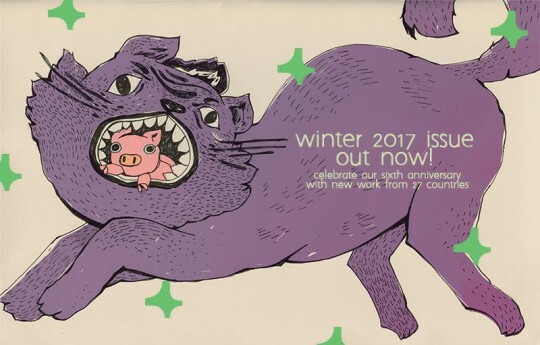 Our Winter 2017 issue, hot off the presses yesterday, celebrated our six years of publishing world literature with new work from 27 countries by authors such as Colm Tóibín, Cesare Pavese and Monika Rinck, alongside a Special Feature on Indian poetry focusing on marginalized voices. 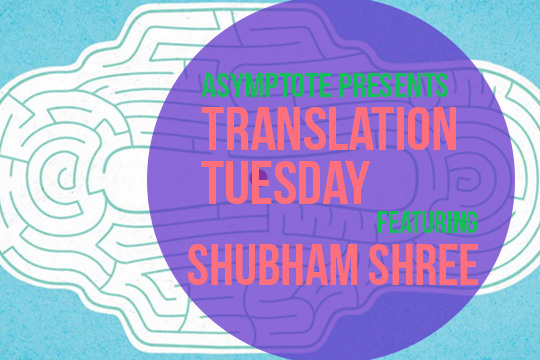 Here, via acclaimed translator Daisy Rockwell, we present two works from this Special Feature by 2016 Bharat Bhushan Agrawal Prize winner Shubham Shree—who recently caused great controversy with her bold use of slang and English words, considered a desecration of the tradition of Hindi poetry.